The National Museum of the Pacific War was the first thing on our agenda this morning, and it was well worth the visit. 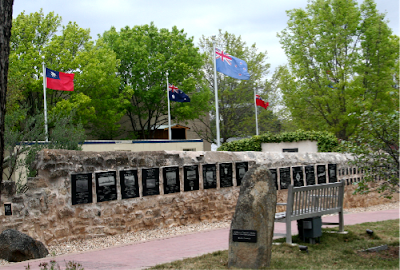 There are multiple walls with inscriptions of those men and women lost in the war outside of the museum. 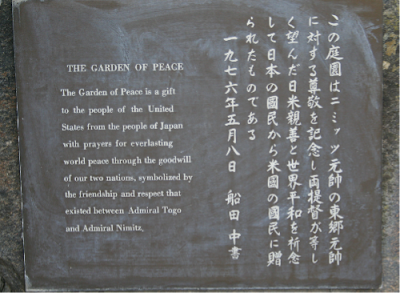 There is also a peace garden provided by Japan. I knew a lot about the second world war in Europe, but this museum clarified the Pacific War for me. 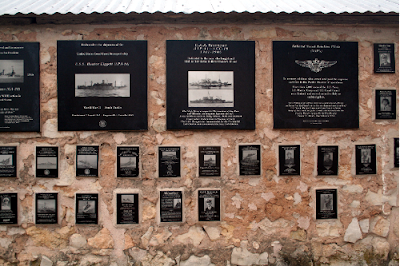 It is certainly worth a visit if you are in the area. After a lunch (a great Reuben sandwich) at the Altdorf restaurant, we headed back to the campground to give the dogs some excercise. Around three, Diana and I headed out for Wildseed Farms which is one of the nation's largest working wildflower farms. We walked the trails along side the fields where the wild flowers are grown for seed harvesting. 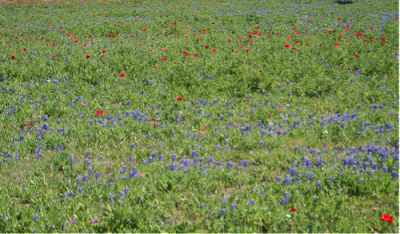 The fields of Bluebonnets and Poppies are just coming into full bloom. We then took a drive down the Main street in Fredricksburg a little further west than we did last night. We got out of the vehicle and walked around the market place park that is located in the middle of town. 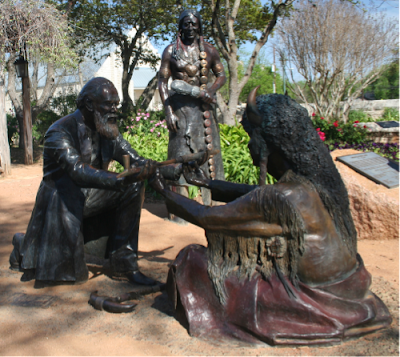 It is a great park with walking trails and areas dedicated to various periods in the history of Fredricksburg. What a nice restful place in the middle of this city. This "tree" depicted the history of Fredricksburg. When we got back to our rigs, I took a few pictures of some of Emma's entertainment that is located about 25 feet outside our front windows! 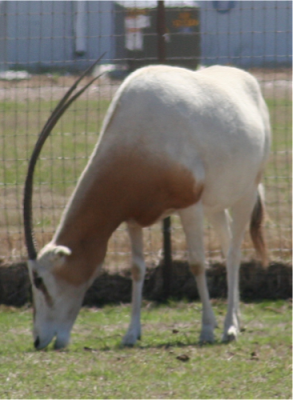 I think we may go to Enchanted Rock State Natural Area tomorrow after an early visit to one of the bakeries in town. We headed out just before ten, this morning, and had an easy drive ahead of us. By about eleven, we were only about fifteen miles from the KOA where we had reservations, so I gave Diana and John on the phone and suggested we stop at the LBJ National and State Historic Sites. We would pass right by them and the weather had warmed up nicely. I had visited the National Historic Site with my sister in January in some very miserable weather, but Diana and John had never been there. After stopping in at the visitor's center, we walked to the state historic site which is a nineteenth century farm. After about two hours spent viewing the exhibits and the farm, we headed back to the rigs for a light lunch. We were going to unhook my car and do the drive around the LBJ Ranch that I had done with my sister, but decided to head for the campground instead. Since the ranch is only a short distance away, we can easily do that trip later. By that time it was almost 5:30, so I fed Emma, took her for a good walk, and got ready to go out to dinner. We headed into Fredricksburg to eat at the Auslander restaurant. This place was recommended by the campground owner as the best German food. John and I ordered JaegerSchnitzel and Diana had a Reuben sandwich. There was really more food than I could finish, but we all agreed that it was good. We walked around Main Street for a while to see what kind of shops were there and to find the Nimitz Museum that we will visit tomorrow. Then it was back to the rigs just before sunset. My site is the last one in the row, and is adjacent to a piece of property that has lots of animals on it. Emma is in heaven! 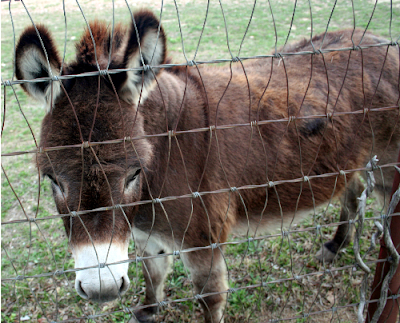 As she sits on the dashboard, she can see a pregnant donkey (that loudly protests her condition), a cage with some kind of exotic monkey-like creatures in it, three barking dogs, and a bold large squirrel that keeps her heart pumping! I imagine that she will be up before dawn and in the window keeping vigil on this menagerie. So much for sleeping in on this mini-vacation. Tomorrow I hope to take some pictures. I have excellent internet reception here, so maybe it won't take hours to upload a few pics. Yesterday afternoon, after the school program, I decided to start packing things up outside for our trip on Sunday to Fredrickburg. I took down the sun shades that are on the outside of the front windows; they are certainly easier to take down than put up. I also folded up the outside rug, packed away the gas grill, put the Blue Ox towbar on the back of the motorhome, and generally got most everything done outside. I left out one chair and will still have to bring in the electric, water, and sewer hose, but I feel pretty good about getting as much done as I did. John and Diana were busy doing the same thing and John ended up on top of his rig to check for hail damage. He found some cracks in his air conditioner cap and the awning over his slide-out was pretty shredded. When he got down, he brought over his long ladder so I could take a look at my roof. I was a bit apprehensive as I climbed up. I have a ladder on the back of my rig, but that's where the bicycle is attached, so I can't get around it. I was relieved to find no damage up on top. :) Boy, am I glad I pulled in the slide-outs just before the storm hit! I was feeling pretty lucky that the rig made it through the storm unscathed. As I was rolling up one of the water hoses for storage, I glanced at the sewer hose. It turns out that the hail did a number on it and the end foot or so looks like Swiss cheese. Oh, well, that is a minor problem considering what damage there could have been. I'm going to apply some good old duct tape this afternoon, before dumping the tanks. I'll be looking for a new short hose the next time I'm at Wal-mart. I was finally able to upload the hail picture. I'm surprised because the winds outside this morning are in the 30-40 mph range. It was 35* when I got up this morning. There is a snow storm in the panhandle of the state, so I'll put up with chilly temps and high winds as long as there is no snow! A little before noon, we will head for Doeskin Ranch for the Girl Scout program. After that, it will be time to start getting the inside of the rig ready to hit the road. 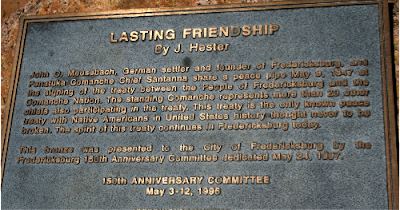 Hopefully, my next post will be from Fredricksburg! Yesterday about fifteen of us got together at a local restaurant for lunch to honor Paul and Peggy. They are the volunteers that have been here for three months and will be pulling out next week to head back to their home in Vermont. Afterwards, we headed back to the office to load up the van with all the materials we will need for the birding program for today. Then tomorrow, we'll be having another program for a large group of Girl Scouts. That will make five days in a row of work this week, but then on Sunday we'll head for a three day vacation in Fredricksburg. I'm looking forward to that even though I'm going to have to get busy tomorrow and pack everything up and get ready to go. I thought I'd try to post another picture of the hail from the other day, but as usual my internet connection is challenging me. I turned the TV on about 4:30 today and was immediately assaulted with severe storm warnings. The approaching storm was about 30 minutes away and it seemed we would have high winds, lots of rain, and hail! I called over to Diana and John with the forecast, and John said he was moving his truck down to the vehicle barn down by the office. He suggested I do the same with my new car. I heeded his warning and we both drove down and got our vehicles under cover. A town not too far from here had baseball sized hail coming down! I didn't need hail damage on my new vehicle. I couldn't do much about the motorhome, though. When we got back, I put my tomato plants under the motorhome and put my two chairs and tables under the motorhome along with my new grill. Emma was there to help (?) as I tried to batton down the hatches. Just as Emma and I jumped back inside, the wind really picked up and I decided to pull in the slide-outs. That's not easy to do on a moment's notice, but I pulled it off, thank goodness. The storm arrived, my satellite reception ended, and the thunder and lightning rolled. I couldn't believe the noise when the hail started coming down. It was so loud pounding on the roof that you couldn't hear anything else. As I looked out the window, the hail was bouncing off Diana and John's fifth wheel and I was glad I had pulled in the slides. It seemed like it went on forever, but in reality is was about fifteen minutes. I worried about damage to my roof. I'll have to check that out at a later date, but for now there was no damage to the sides of the rig and no windows broken. 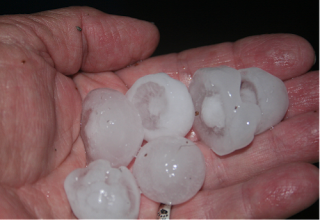 The hailstones were an inch in diameter. The temperatures went from 85 to 50 in very short order. After about an hour and a half, the sun was out! What a weather event that was. I've tried to upload a close up of the hail, but as usual, I'm having difficulties with my reception. This morning we had the cave presentation for a school group and everything went very well. The word for the day was Troglobite! (that's the name for invertebrates that live in caves, have no vision, and are minute in size) There are two more school groups coming this week and we will be doing presentations on birds...right up my alley. It's really getting late now, after midnight, so I'm going to bed. Here's your chance to be a winner! I haven't had many comments on my blog, so I thought I'd run a contest to see how many of you folks are reading this. You have to click on the word "comments" that is located at the end of this entry and post your answer to the challenge of "Name that skull!" 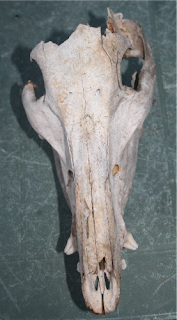 This skull had obviously been there for a while and was picked clean. There were a few other bones scattered around the area, mostly vertebrae, but no legs or ribs or other clues. So, what do you think? I have my guess that I will check out with the refuge biologist tomorrow. I'll wait a few days before posting the winner. There really will be a prize... (remember all those walking sticks I have been working on?) So post your guess now....live on the wild side!!! Yesterday, shortly after noon, Diana, John, and I headed toward Austin to go to the Lady Bird Johnson Wildflower Center. They were having an artisan show at the center. The grounds are like an arboretum with trails leading to different gardens of wildflowers. I, of course, was wanting to see the Bluebonnets and I wasn't disappointed. 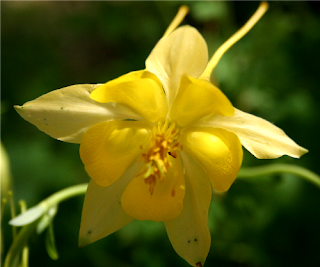 Other wildflowers were blooming as well, and I found a nice yellow columbine. I think columbines are my favorite wildflower. 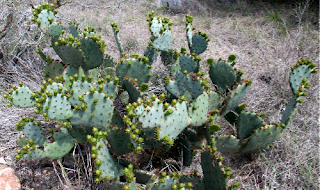 We walked down several of the trails and even the prickly pear cactus was looking beautiful. 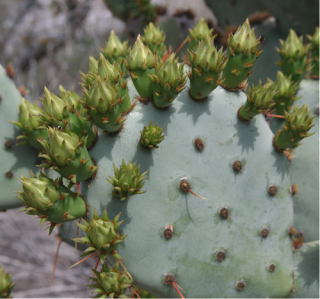 Almost all of the pads of the cactus had these interesting growths on them. I don't know if these things will turn into flowers or not. I guess I'll just have to wait to see what happens. I met Peggy and Paul up at the Flying X this morning to take a several mile hike down into one of the canyons. I'm glad I had my walking stick along! The descent was pretty steep and the trail was covered with rocks that made for a slippery walk. Of course, we had to go back up that climb on the way back. We had hoped to see and hear a number of golden-cheeked warblers, but other than the many cardinals singing and numerous black-crested titmice, it was a pretty birdless hike. We finally did hear one black and white warbler on the way back and one golden-cheek. We also checked out a pond on another tract of refuge land and heard another golden-cheeked there. It was an enjoyable outing and we enjoyed the scenery of the hills. Spring is arriving and there was big variety of shades of green on the various trees. Spring green up is always invigorating. This afternoon I did some reading and grilled out tonight. Not much else is happening. I was shocked to find that I had excellent cell phone and internet access this morning. I took advantage of this situation to take care of a few bills electronically and to make a few phone calls. I never know when I'm going to have great reception, and was happy to discover this on a day off. I tried calling Big Cypress Nat'l Preserve in Florida and once again had to leave a message. I did this about a month ago, and did not receive any call back. I'm trying to set up a volunteer position for next fall and winter. After striking out at Big Cypress, I decided to try calling Buenos Aires Nat'l Wildlife Refuge in SE Arizona. I actually got to speak to Bonnie, the volunteer coordinator, and things sounded pretty possitive. She will be emailing an application to me. Buenos Aires is located about 80 miles south of Tucson. I'm looking to expand my winter horizons beyond Texas! I also got a call from the Ford dealer in Marble Falls today. Apparently the part for the passenger's side floor has arrived in four days, as opposed to two weeks. I'm thinking I may just drive into Marble Falls tomorrow and get it installed. Then I'm going to make a terriaki shrimp stir fry on the grill. I was able to get a pound of gulf shrimp at the HEB grocery store in Cedar Park last week and I do like stir fry and gulf shrimp! Yesterday was spent doing the Post Oak Creek Trail bird survey and working on my educational presentation about endangered invertebrates found in Texas caves and sink holes. 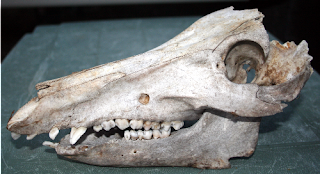 I'm trying to wrap my mind around pseudoscorpions, cave harvestmen, tooth cave ground beetles, and cave mold beetles. Karst invertebrates and their lifestyles and challenges are helping to keep my mind from going dormant. ;) I always endeavor to learn something new at each of my volunteer assignments, but I must say that itty-bitty insect cave inhabitants is really pushing my envelope! What a life this is!! A Super Golden-Cheeked Warbler Day! Working on mundane chores in the afternoon just seemed too anticlimatic, so I asked Diana if she would like to go out to take pictures of the bluebonnets. She had been working all morning on the computer developing some maps for the educational programs, so she was more than ready to join me for a road trip. She printed out a map of the bluebonnet trail and off we went. As it turned out, it's just a little early in the season for spectacular shots of the bluebonnets. 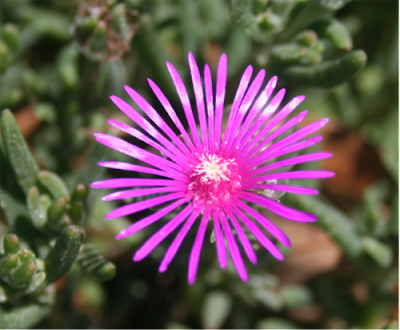 We saw small bunches of them, but nothing very noteworthy. The afternoon was not a loss, however, as we drove around and saw a few more lakes that are made by dams along the Colorado river. We even took a tour of the Shady Oaks RV park. This is a park right along LBJ lake. We came upon this park after driving down a road we thought would take us to one of the dams. The park is for retired persons, only. The sites were pretty close together, but the rent was only $230/mo plus electricity. They really like to have folks that are going to live there full time. It's OK if you like fishing, but certainly didn't appeal to us. We headed home after our afternoon get away. No pictures today, but I'll try again soon. PS. I heard from Lowe's about the blinds and they do not do work in motorhomes. That kind of bites! I'll have to think of something else. I did the three hikes out at Doeskin Ranch this morning, and although I didn't find any golden-cheeked warblers, there were some new and different birds along the surveys. Two turkeys gave my heart a start as they suddenly took off, I found a Lincoln's sparrow, and a pair of Eastern bluebirds were sitting in a tree along with a singing lark sparrow. After last week's rain, there were also some ring-necked ducks on the old stock pond. Up to this point I had only seen 23 turtles in this pond. The temperatures warmed up quickly and it was eighty by the time I finished the surveys. In the afternoon, I went over to the Flying X to help cut out fabric for some bags that Diana and Peggy are sewing to hold the ten or so tables that are needed for the education programs. Peggy and Paul will be leaving on the first of April. I have decided I'd like to move into their site after they leave at the Flying X. I would stay there for a month before I head on down the road. I think I would enjoy the change in scenery. The site is on top of one of the tallest hills and the views are very nice. I've left a note for Rob (who is on annual leave this week) with my request to change my site. This is also the week we were supposed to spend three nights in Fredricksberg. As it turns out, because of it being spring break, there are no campground sites available in the area. So, that little side trip has been postponed for a couple of weeks. I'm still very interested in going there, and maybe we can do it during the middle of the week in the near future. There are a couple of weeks where we have to work on Friday and Saturday because of educational programs. It may be possible to get a reservation at a campground if we do it in the middle of the week. 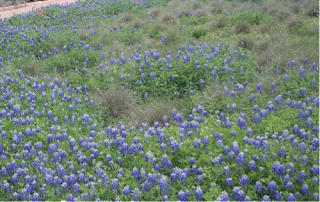 On the way back from the Flying X, I noticed several areas where the bluebonnets have started to bloom. They're just starting, but that's one of the reasons I came to this refuge...to see the bluebonnets. I will get some pictures as the bloom increases. I'm sure last week's rain really helped out! I've had a real challenge tonight with publishing this blog. I had a whole entry written and then it disappeared. Sorry for the duplicate post. When I awoke this morning, it was down to 35*, but my tomato plants seemed to survive in good condition. Eventually, it warmed to the eighties in the afternoon and there was no rain! I headed out around 10:00 for Marble Falls to do several things on my "to do" list. First stop was the Ford dealer. Last month when my sister, Pam, and I were out doing the tourist thing at the LBJ ranch, the border at the bottom of the passenger's side door broke. I wanted to order a new border, and was able to do so. It will take a couple of weeks, but the warranty person did order it after checking my mileage to be sure it was still covered. Since I only had 1,111 miles on the odometer, it really wasn't a problem. I'll wait for their call. Then it was over to Lowe's to try to order some blinds to replace the day/night shades that have been more than a frustration to me. After over an hour placing the special order for the size of my windows, the associate decided to check to see if they would install the blinds in a motorhome. She was unable to determine if they would do this. I don't see why they wouldn't. They are supposed to call me back once they are able to speak to their installer. She didn't leave me with the impression that they would do it, but I'll continue to pursue this option. While I was there, I also checked out a new gas BBQ grill that was the right size to accomodate the grilling surface that I like from my nonworking Holland grill. After getting back home, I assembled it and the cooking grill from the Holland fits just perfectly. The instructions said it would take 30 minutes to assemble, but multiply that by three and that's how long it took me. I fired it up and everything is working fine. What a relief! I like the cooking surface from the Holland because nothing falls through and I can even stir fry on it. I then went to HEB to get my groceries and try to purchase a weather alert radio. There has been a special deal for these radios between HEB and a local Austin TV station. Of course, they were out of them, so I guess I'll try later this week. It will help to have this warning station as I travel through tornado alley this spring. I don't exactly have a basement to retreat to in serious weather. I do check out where I can seek refuge, just in case, where ever I stop, but the radio will help warn me. Tomorrow is St. Patrick's Day, so I felt I had to buy a corned beef brisket and cabbage. I'm not sure I'll fix it tomorrow, but I'll have it soon. I do love corned beef! 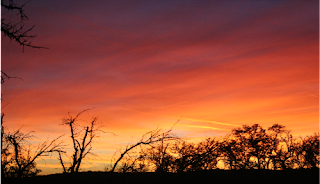 I'll be up and off to so the bird survey at Doeskin Ranch tomorrow. It should be a great day. A couple of hours of sun! It lightly rained most of the morning, much to my chagrin. ;( I was really getting tired of the rain and cold temperatures. Then around four o'clock the sun burst through and I dragged my rocker out of storage and enjoyed a few hours outside. I worked on a couple of walking sticks that had been out in the rain for the last five days, and it seemed easier to get the bark off of the soaked sticks. Earlier in the afternoon, Emma and I went for a walk and I unclipped her from her leash. She was ecstatic! She ran and ran and ran. This was the third day in a row that I let her loose. She is a young, energetic dog, and it is a joy to see her expend all that pent up energy. After about a half hour, she is ready to come back and peacefully walk with me back to the motorhome. Along about 7:00, Diana and John returned from their five day trip to Houston to watch their son, Austin, compete in a national collegiate swim meet. They brought their boat back with them to use on the nearby lakes. They were as happy as I to see the sun shining and the promise of warmer days ahead. I've stayed pretty close to home the last five days, so tomorrow I've plans to go to Marble Falls for some shopping. I'm thinking of talking to the folks at Lowe's about replacing my day/night shades with blinds. I may also buy a new grill since the one I have doesn't seem to even cook hotdogs in less than an hour. I keep my extra rolls of toilet paper under the bathroom sink. About a week ago, I opened the cabinet to get a new roll, and was surprised to see that it was pretty well shredded. After the issue with the generator wires, I was not pleased to discover more evidence of rodents. I have been carrying around a mouse trap since I hit the road, but haven't had a need to use it. It looks like it may be a little warmer today. I have spent most of the last three days inside. There has been more rain in the last three days than this part of Texas has seen in 17 months. There is only a 20% chance of rain today, so maybe Emma and I can get out and take a good hike. The storms have also played havoc with my internet reception. I think I'll also head to town for some groceries this afternoon. I'd like to say a big hello to my mother and her roommate, Lynn. My brother reads my blog entries to them when he visits at the nursing home. I will try to call on the phone when I get to a better location. I have very poor cell phone reception here in the hill country. Spring break begins in the Austin area this weekend for all the school districts and many other districts in the state. It looks like the kids will have some great weather starting on Monday. I know I look forward to being able to sit outside again! It's a rainy day in Texas!!! WOW! The trailer began to rock in the wind, the lightening was flashing and the rain came pouring down, and it was five in the morning! What a way to start the day. It abruptly woke me up and I was unable to go back to sleep. It was two hours before any semblance of daylight, so Emma and I just waited it out. She was a little anxious to get outside, so as soon as the rain calmed down we headed out the door. It was obviously not a good day for a bird census, so I decided to work at home today especially since Rob came up the hill about 8:30 and took the van away. I had plenty to work on getting ready for a presentation on cave creatures and preparing for the insect station for Friday. When I awoke at five, the temperature outside was 70, but within a short time it dropped down to 45. I turned the electric heaters on, but couldn't get the inside temp up to where I was comfortable, so I turned on the furnace. Normally, I would just suffer through the lower temps, but since I'll be taking the motorhome to Fredricksberg next week, I'll be able to fill the propane tank if necessary. I do seem to get chilled easier these days. I'm sure glad I'm not in Minnesota where the highs for today were in the single digits! I haven't spent so much time inside the motorhome all day in a long time, but going out in the rain isn't something I'm thrilled to do at forty degrees. Thank goodness for the satellite dish. This part of the post is dedicated to my sister and her husband. Others may find the topic unusual....Intestinal fortitude (or not). Have you ever thought of the many ways that lack of intestinal fortitude is referred to? There's diarrhea, green apple quick step, the "runs" and shitskees! Some are rather descriptive. ;( Well, let me tell you, that Emma had a rather liquid response to her vaccinations yesterday. Being the lady that she is, she made it evident to me that she really needed to go out several times this morning before I left for work. I am so happy that I heeded her warnings! On a brighter note, I had a fantastic bird survey this morning. I went to Warbler Vista to do the Cactus Rock and Ridgeline Trails. What a thrill to document nine golden-cheeked warblers! There were also seven black and white warblers along the trail and a first of the season blue-gray gnatcatcher! These sightings were mixed in with the usual cardinals, black-crested titmice, vultures, and a Carolina wren. The wind abated this morning so it was a lot easier to hear the birds in the forest. Since it was in the high sixties this morning, I was able to wear shorts and a tee shirt in comfort. Things don't look so bright for the rest of the week. I guess I have gotten spoiled this last week with the pleasant temperatures. By tomorrow morning, rain is supposed to move in and the temps will soon plummet. I guess I'll have to get out my jeans and warm coat again. :( I will welcome the rain, however. Maybe it will help with all the dust from this drought ridden area. Well, after contributing close to $200 to help the economy ;) , Emma and I returned from the vet. She got her nails trimmed, got shots for rabies and distemper, got seven months of heartworm medicine, and got two kinds of medicine for the yeast infection in her ear. So, we're set for another year. Oddly, it appears that I have internet capabilities this evening. Saturday, we had a cookout up at the Flying X with the other volunteers. The food and the company were good. I got some ideas where to stay in Arkansas in May on my way to Missouri. One of the couples is from Arkansas and the other suggested a Corps of Engineers Park to stay at while I visit Hot Springs Nat'l Park. Yesterday and the rest of today was spent doing household chores. Not very exciting, but necessary. I had planned to call some volunteer coordinators today to try and firm up what I'll be doing next fall and winter, but I couldn't get any reception. I may have to drive into town to do my phone calls. The forecast for this coming week includes 2-3 inches of rain. That will be most welcome in this area. Rainfall right now is at a 25" deficit. Rain would certainly green the area up and decrease the very high fire danger. The plan was to leave this morning at 10:00 and head to Cedar Park for a day of errands and shopping. Diana and John drove this time and we headed out on schedule. First stop was the vet in Lago Vista to make an appointment for Emma to get her rabies shot, get her nails trimmed, and have her left ear checked out. The appointment is set for Monday morning. Then it was on to visit several Goodwill Shops to see what they had to offer. Diana was looking for picture frames, John was looking for some shorts, and I was just wandering around with nothing in mind. We stopped at three different places, and we were all successful in our quests. I ended up buying a dictionary, a book, and a wok. There have been a number of times since I've been on the road that I wished I had a dictionary. Spell check is fine, but sometimes you need something more. I had been wanting to fry some rice noodles, and a wok for $1.99 was affordable. I may try it out later this evening after cleaning it up a bit. Then it was on to Walmart after stopping for lunch at J&J BBQ. I ordered a baked potato and it had to be the biggest potato I've ever seen. I just couldn't finish it all. I wanted to stop at Walmart to get two new tomato plants and some planters. Then it was on to HEB for groceries. We're having a pot luck up at the Flying X tomorrow and I will provide the salad. So, I accomplished everything on my list for the day, and checked everything off. It was six hours before we got home and the dogs were all anxious to get out of the rigs. After transplanting the tomato plants, I headed inside to feed Emma, and I'll spend the evening watching TV. A little after nine, Diana and I headed out to take the refuge van to Liberty Hill, TX, for an oil change. Volunteers here have to take their vehicles into town for the oil changes. At other refuges that I've been at, the maintenance staff takes care of these routine services. There is only one maintenance staff here, so we handle those chores for our assigned vehicles. On the way to Liberty Hill, we stopped at the Shin Oak Observation Deck. This is in the area where the endangered Black-capped Vireo nests. 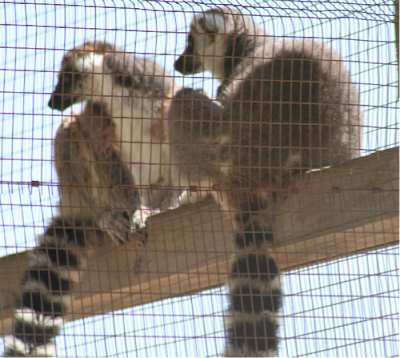 They have not arrived from Mexico yet, but I wanted to see the type of habitat that they favor. It is vastly different from the Golden-cheeked Warbler habitat. The vireos favor brushy dense oak areas where they build their nests at eye level or lower. The Golden-cheeks, on the other hand, prefer old, tall Ash-juniper forests in the canyons. We were able to get right in for the oil change and afterwards decided to look for a place for lunch. Hobo's restaurant had been recommended, so we stopped there. We both ordered the lunch special which was chicken-fried steak. I had the sides of French fries and fried okra. For those of you in the North, the chicken-fried steak is a lightly breaded cube steak that is smothered in white gravy. The okra is breaded and deep fried, and you know what French fries are. This was served with buttered toast...so this lunch was a once in a while indulgence with artery clogging goodness! We tried a different route home, and kind of got lost in the hills. We came upon a man on a horse, and as Diana pulled the van over, I told him we were lost. He was very helpful in directing us to a road we recognized, but proceeded to give us his life history. I would guess he was about forty years old, and had recently told the CEO of the company he worked for in Dallas, to take his job and shove it. It was an interesting encounter. I enjoyed the scenery while wandering around the countryside. The hills are similar to upstate New York, but the cactus and lack of hardwood forests make it much different. It has its own beauty. It's obvious that water really plays an important role in this area. 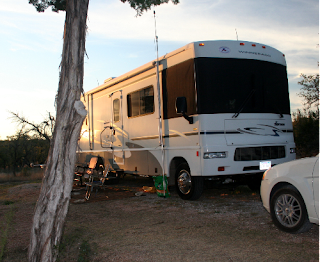 After we returned home, I started investigating Fredricksberg and decided I'd do best to drive the motorhome there for a few days to fully enjoy the area. More on that later. Once again, I'm having issues with my internet connection. This is a challenging location! During my bird survey at Warbler Vista, I heard the first Golden-cheeked Warbler of the season. That was definitely the highlight of the day. The rest of the hike was uneventful, and the hike around Post Oak Creek Trail was also less than exciting. 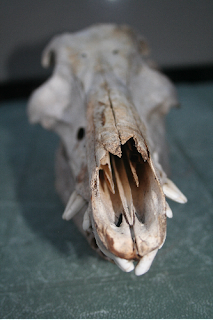 I spent the afternoon working on ideas for an education program on invertebrates of caves. How's that for excitement? After returning home, I enjoyed sitting outside in the eighty degree temperatures and working on one of my hiking sticks. Not much else to report for today. I was rudely awakened at 6:30 this morning by Emma's barking outburst. When I looked out the window at the head of my bed, I knew the cause of her excitement. There was a deer almost close enough to touch. Emma had seen her out the front windows. So, I got up and readied myself for another bird survey. I did the three and a half miles of trails at Doeskin Ranch and saw a greater variety of birds than I did last week. It was pretty windy, but it was warm enough to remove my sweatshirt by the last two trails. I do enjoy these morning surveys and look forward to discovering the new species each week as the migration season begins. When I got back to the rig for lunch, I first took Emma out for a walk and then hooked her up to her outside cable. As I was putting together the final touches on my lunch, I noticed that Emma was walking around right outside the door. The cable shouldn't have allowed her to walk that far. Sure enough, she had slipped away from the cable some how. I casually stepped outside and called her over. She took one look at me and headed the other direction. She went over to Diana and John's rig with me in fast pursuit. The only reason I got her back on the leash is that Buffy went berserk and Emma went up their steps. She is a frustration to me at times. After that little interruption, I sat down to lunch with Emma inside. She was very interested in something right outside the front windows. When I took a look out the front window, I saw two birds literally attacking my car. On one side was a mockingbird and on the other side was a cardinal. Both were very active trying to peck their reflections in the windows and the outside rear view mirrors. The result of all this activity was an abundance of bird poop on the windows and mirrors. Breeding season can't be far away with this demonstration. Maybe I need to cover the whole car before they knock themselves out! This afternoon I attended a meeting with Rob and all the volunteers. I have worked with some random thinking type people before, but Rob really takes the cake. This meeting went on for over two hours and should have only taken about twenty minutes. Oh well, tomorrow it's on to Warbler Vista for another survey. I'm hoping to find the first golden-cheeked warblers of the season. Yesterday, Diana, John, and I headed for Marble Falls. I wanted to check out another Walmart to find some rugs, and Diana and John wanted to get some indoor/outdoor carpet to put down outside their rig. We stopped at a sit down (not buffet) Chinese restaurant for lunch that was pretty tasty. While we were in Home Depot, I decided to try a green outdoor carpet that I could use inside for the dashboard. It doesn't look like grass, and will go with the green carpeting in the motorhome. I bought a piece that was 6' X 8' that I can cut in half and have an extra one for less than what it would cost for the two area rugs I had planned to buy at Walmart. After chilly overnight temperatures, I turned up the furnace when I got up. After breakfast it was a busy and productive day. Emma and I went for a long hike and then I started on the chores for the day. I cut the green outdoor carpet in half, and with Diana's help, we fashioned a covering for the dashboard that conforms to its shape and will be easy to care for. It looks much better than what I had before, and Emma seems to approve. Then I went outside and washed the front of the motorhome and the car. I wanted the front windows clean before I put up the sun screens. John brought over his longer ladder and I was able to put them up without any trouble. They snap on the outside, and I can't quite reach the top to snap them on with my ladder. These black outer shades keep the inside cooler. I can also see out from the inside, but you can't look in from the outside. I didn't want to try to put these up when I was the only one on the hill. I have to balance a footstool on top of my ladder to reach the top, and were I to take a tumble, no one would know if I took a header. I also did the laundry and worked on several walking sticks. All in all, a productive day. "Boy oh boy, this is the best place we've been at so far! I get to spend almost all day outside and if I bark occasionally, it doesn't bother anyone. I'm not sure I like those coyotes howling....it makes my hair stand on end. My human and I take long walks everyday and I've found lots of sticks to chew on. We were the only ones here for quite some time, but now my friend John is here and he really likes the way I jump and flip around. Now if I could only figure out how to get Buffy and Lilly to play with me. I can't figure out why they don't like me....."